Discussion in 'The Airport' started by Linearis, 10/14/18. Also I wonder how many she needs before she can fly moderately well. Teckechick, faislaq and sunnysmom like this. It sounds like a fid milestone! I know when my guy looses them it's usually a feather on 1 side & the next day it's a feather on the other side. For what I call molting losses. It sounds like you have more molting coming. I know it feels like a life time till she can fly, but be patient it will be on top of you before you know it. Haha thanks, yeah the one feather is on both sides already, just wondering when the others will pop up now. Note that this isn't first time she is growing primaries, just she came to me clipped so I have to wait for them to grow back now. Buddy still has 1 clipped feather left, it's now been over 1 year ago, his annual came & went in Aug. I wish I could help more. Sorry. I am really proud of one of my little birdies he is growing his feathers back REMARKABLY! Garet, Leih, Rain Bow and 1 other person like this. Rain Bow and Bonkers like this. He looks like a little sweety! His color is very nice too! May I ask what type of bird he is? I'd like to look up about him on Wiki. Awww so sweet! I'm a new birb parent to one lovebird and two linnies and didn't lnow any better when I got them, so they are all clipped. I don't intend to keep them clipped but for now the lovie still can fly pretty well. My flock is just losing a few down feathers here and there. So glad someone reminded me about molting or I'd be panicking about the sorta scruffy looking feathers! What in the world happened to its tail feathers??? I assumed they were still coming in. Unless I'm missing something here, a bird doesn't loose all its tail feathers or it couldn't fly. No prob! That is a regular Parakeet. (Im in the USA, so you may call them budgies or Budgerigars where you are from.) 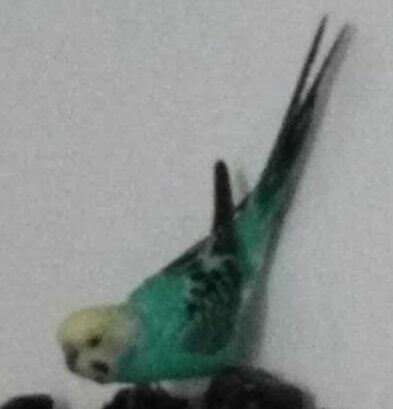 Regular parakeet, not English. 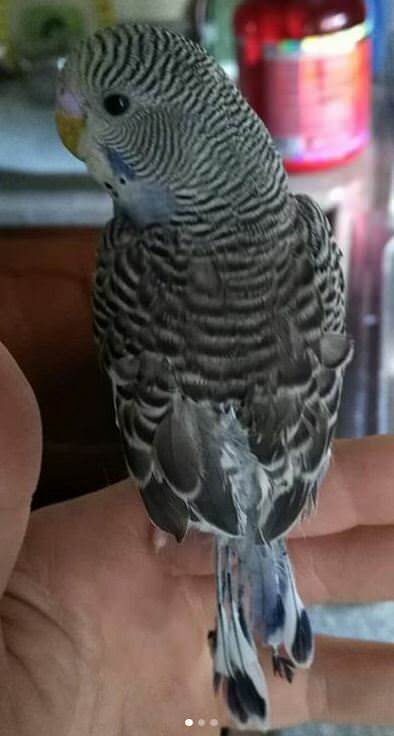 I keep asking what kind of blue he is, but, in my bird knowledge, I think he is young because of all the bars across his head, and his eyes are still all black (no iris visible yet, they look so cute.) I am so happy you like him! He sure is a cutey!!! He is a Cutie! I'm in the USA too, I see it (budgie) in the new picture. The other 1 looking @ his back, he looked bigger to me. I was also beat that night when I posted. I get daft after a real long day. How are his feathers doing now, it's been about a week? Woah Yesterday she was really getting some flying experience. She flew all over, still not super well but she's definitely getting some confidence. 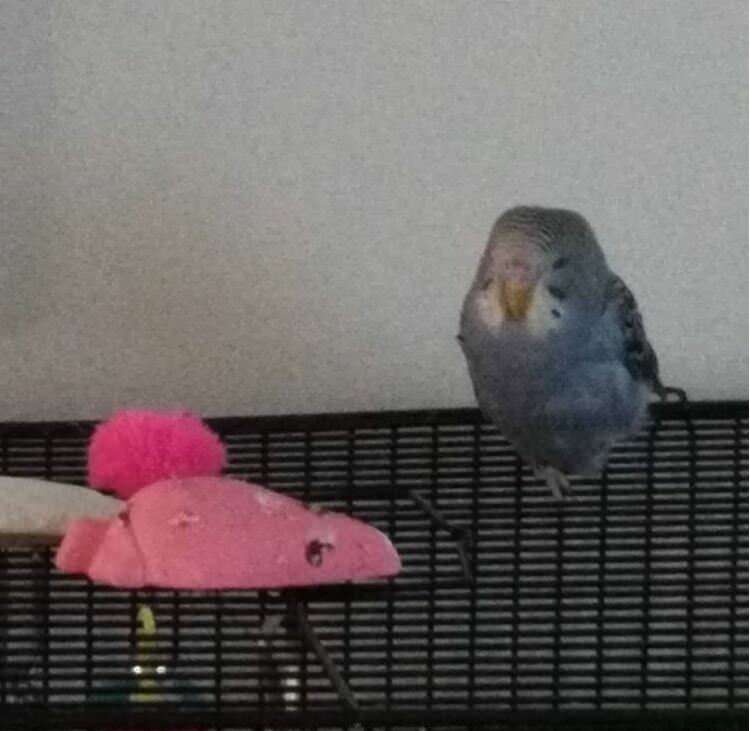 She flew from bed to cage, chair to bed, bed to close to floor but then flew back up to bed, flew onto the ground (kinda fell tbh but shhhh), and the other day she flew ontop of dresser (she got spooked) and then flew down to me when I called her. So proud of her. I bet next month she'll be even better.